Beyblade Burst tops bring wild fun to the Beyblade Burst Beystadium. Beyblade Burst tops can "burst" into pieces, resulting in 2 points for the other player (burst rates vary). First player to earn 3 points wins! 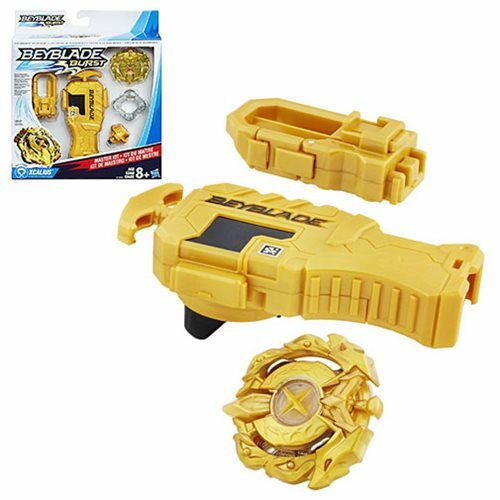 The Beyblade Burst top's components, included in this kit, are interchangeable with most Beyblade Burst tops except Beyblade Burst Rip Fire tops. Collect, customize, and compete! The Beyblade Burst Master Kit comes with 1 Beyblade Burst string launcher, 1 Beyblade Burst belt clip, and 1 Beyblade Burst Xcalius top [consisting of Xcalius Energy Layer, D11 (aka Force) Forge Disc, & TA05 (aka Xtreme) Performance Tip]. Scan code on Beyblade Burst Energy Layer and Beyblade Burst string launcher to unleash them in the Beyblade Burst app. Let it rip! Requires Beyblade Burst Beystadium, sold separately. Ages 8 and up.